Duke entered the NCAA Tournament as the heaviest favorite in four years. According to a survey, 1 in 5 American adults will place a bet on the tournament. 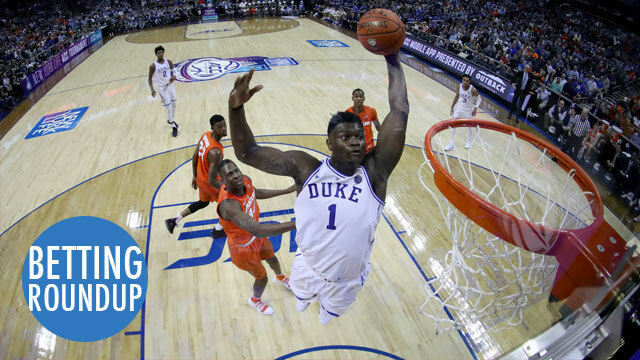 Forty million Americans will combine to fill out 149 million brackets this week, and 18 million adults will bet on the tournament with a bookmaker, the survey found. All together, $8.5 billion is expected to be wagered on March Madness. The AGA estimates that the NCAA tournament generates 40 percent more betting handle than the Super Bowl, making it the most heavily bet U.S. sporting event. “Unlike any other sporting event in the country, March Madness attracts millions who fill out brackets, make casual bets with friends or wager at a legal sportsbook, which Americans can now do more than ever before,” Bill Miller, president and chief executive officer of the AGA, said in a release announcing the survey results. A bettor in Mississippi hit on a 20-leg parlay. On March 8, what may be the greatest parlay wager ever to hit at a U.S. sportsbook was placed on one of them — a $25, 20-leg bet that paid $104,412.44. BetAmerica, the sportsbook operator for Riverwalk, said the parlay resulted in its largest payout since the book opened in August. Through the sportsbook, the bettor asked not to be identified. The parlay featured point spreads, money lines and over/unders on a mix of Friday night NBA and college basketball games. The bettor backed 14 favorites, three underdogs and three overs. They all came through, but there were some close calls. NBA Commissioner Adam Silver said legalized sports betting decreases the risk of corruption. Marshall athletic director Mike Hamrick disagrees. Both were interviewed for an episode of 60 Minutes that will air this Sunday. Hamrick thinks that with legalized gambling offering so many different ways to wager on a game, including more and more bets placed during games, it may be easier to convince an unpaid athlete to influence a game. “It’s very tempting. It’s very tempting,” he says. “They can be compromised. And– our job is to make sure they’re not compromised,” says Hamrick, who says educating them to potential schemes is crucial. Two casinos in West Virginia that suspended sports betting operations are still suspended. In the same article, West Virginia Lottery Director John Myers said mobile sports betting is on hold due to a new opinion on the Wire Act recently made by the U.S. Department of Justice. A casino in Pittsburgh started accepting sports bets just in time for the NCAA Tournament. In Pittsburgh, people were placing legal sports bets at Rivers Casino for the first time on Thursday. “If you would have asked me 43 years ago, would we be here like this, I wouldn’t have had an answer for you,” said Jimmy Vaccaro, a bookmaker. “Remember back then the gambling thing was more of a niche crowd but now, as you can see, mainstream America is involved. Maryland will not hold a vote to legalize sports betting this year. Maryland Senate President Thomas V. Mike Miller Jr. said Thursday that the General Assembly will not consider legislation this year to legalize sports gambling, meaning that the earliest the state could implement a system to authorize and tax betting on athletic contests is likely 2021. “Sports betting is going to have to wait until next year,” Miller (D-Calvert) said Thursday when asked if lawmakers would consider legislation before the General Assembly adjourns early next month. Miller, Gov. Larry Hogan (R) and House Speaker Michael E. Busch (D-Anne Arundel) had all expressed support late last year for legislation to approve sports betting, so that Maryland would not lag behind other states who are legalizing the practice. But Miller said Thursday that the office of Attorney General Brian K. Frosh (D) told legislative leaders that the only way for Maryland to expand gambling is to amend the state constitution, which requires a public referendum. New York Governor Andrew Cuomo is not keen on online sports betting. Gov. Andrew M. Cuomo, who in January signaled support for a limited rollout of sports gambling, told WAMC News on Monday that he is “not a fan” of expanding that form of betting to the internet. The governor also downplayed the potential economic benefits that could come with mobile wagering in New York. A Montana state senator has introduced a sports betting bill. The bill calls for the state Department of Justice to collect 8.5 percent of a licensed sports book’s gross receipts minus winnings paid and federal excise tax each quarter for deposit in a special revenue fund. The DOJ would be allowed to reimburse itself from the fund for expenses related to sports betting and use up to 15 percent of the fund’s deposits to cover operating expenses. Any surplus remaining in the fund exceeding $250,000 would revert to the state general fund. The bill also outlines the costs of doing business for sports book operators — a $1,000 annual licensing fee, a $100 fee for betting kiosks and 5 percent of net income to be paid to the licensed gambling location in which they operate. The bill outlines a similar $1,000 fee for “platform operators,” or sports books that operate online. Despite allowing platform operations, the bill restricts even online betting to physical locations licensed by the state to house a sports betting operation. Connecticut lawmakers passed some bills related to sports betting. Seven states already have legalized sports betting since a recent change in the federal law, and Connecticut could be next. But that’s not what state Rep. Craig Fishbein (R-Cheshire, Wallingford) wants. He pointed out ways that gambling can be bad for bettors and the sports that they bet on, and then he voted ‘no’ during a Public Safety and Security Committee meeting at the Legislative Office Building. “I don’t see this being of benefit to our state other than monetarily and I think that’s wrong,” Fishbein said. But state Sen. Steve Cassano (D-Andover, Bolton, Glastonbury, Manchester) supports the bill exactly because the state can make money off of sports betting. Cassano brought up March Madness and how many locals are already gambling on the NCAA men’s basketball tournament that comes to Hartford this week. A 4-part sports betting docu-series will debut on Showtime on Sunday.